Frequently, I am asked about free and low cost treatment for opioid addiction. Whenever I write an article about patient assistance programs, I get a flood of calls and emails from people struggling with opioid addiction and also from the loved ones of the opioid addicted. Unfortunately, there are few options available right now. But thanks to the Opioid Crisis Response Act of 2018, there may be hope in the near future. Soon, there will be billions of dollars of funding available for programs ... See More that provide MAT, or Medication Assisted Treatment for opioid addiction. What does this mean for the doctor prescribing Suboxone in a small clinic? How can he or she be a part of this program? Applying for grants and running compliant a program can seem overwhelming and intimidating.Yet, many doctors, nurse practitioners and physician assistants would love to help those who need treatment but cannot afford it. So, what is the next step? Bob Coates has the solution. When it comes to healthcare law, Mr. Coates has a deep understanding of how things work. He has owned large healthcare systems and he has served as an auditor and a consultant for many large and small medical facilities. Especially, when it comes to healthcare institutions that may come under scrutiny by federal agencies and law enforcement, Mr. Coates can provide the management needed to allow practitioners and owners to sleep well at night, knowing they are in good hands. He has worked with many pain management clinics and addiction treatment programs. He also maintains a large library of compliance manuals that have provided guidance and protection to doctors, especially those who practice in these high risk fields. Bob Coates is also a family therapist. He currently practices in several states. He is able to provide telemedicine services and he is an expert in addiction therapy. One of the most important aspects of addiction treatment is family involvement. 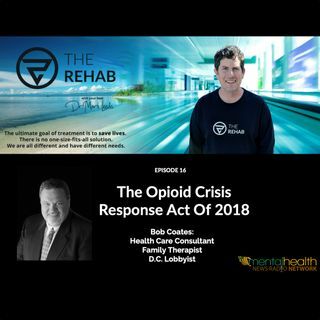 Mr. Coates’ experience as a therapist has given him deep insight into the problems and solutions that involve family and addiction. In recent years, Mr. Coates has served as a lobbyist in Washington, D.C., working with Lobbyit.com. He has been at the center of the action leading up to the president’s signing of the Opioid Crisis Response Act of 2018. He is now prepared to assist healthcare practitioners and facility owners who are interested in applying for grants under this important new law. There are a handful of MAT programs around the country that are funded to provide low cost or free treatment. Soon, we should have many more with new funding from the federal government. Mr. Coates is working hard to help addiction treatment programs, large and small, to obtain funding.